Lady1911 and Wondering Wildcat like this. xxwjtxx, Kirkwood, Nbrackett and 1 other person like this. varga49, Nbrackett and Bmurray like this. Bump for my Osage bushnub II and sheath. Can’t believe this like new outfit is still here. a2vg1095, Scotcha, Bmurray and 7 others like this. Very Lightly Used KEB in Caramel Toned Desert Ironwood. 1/8" A2, SFT with Natural Liners and Yellow Pinstripes. I’ll take this gorgeous blade. Nbrackett, Warrior108, Odaon and 1 other person like this. Paypal preferred, but will accept money order or check with approval. My price include PayPal fees and shipping via USPS Priority. LIf outside CONUS pm me for shipping price. 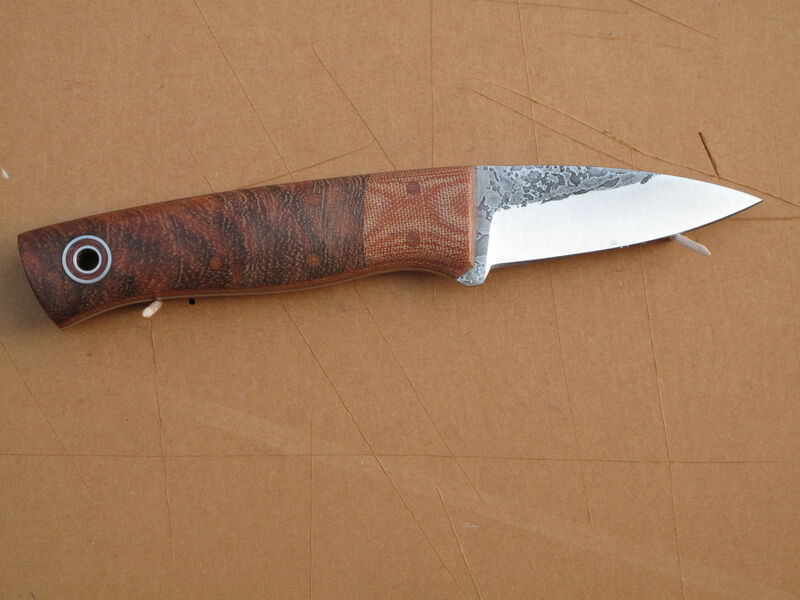 Buyer is responsible for adhering to their local knife laws and must be 18 yrs of age or older. First "I'll Take It" in this thread followed up with a pm or Email and prompt payment gets it. Knives are sold as is. Please feel free to ask any questions, but law of the sharks prevails. I reserve the right to choose with whom I will do business with. Both these knives were received in a trade. They have been sitting in a climate controlled safe. The Bushcraft Jr has a few peppers spots on the blade the hunter is minty! 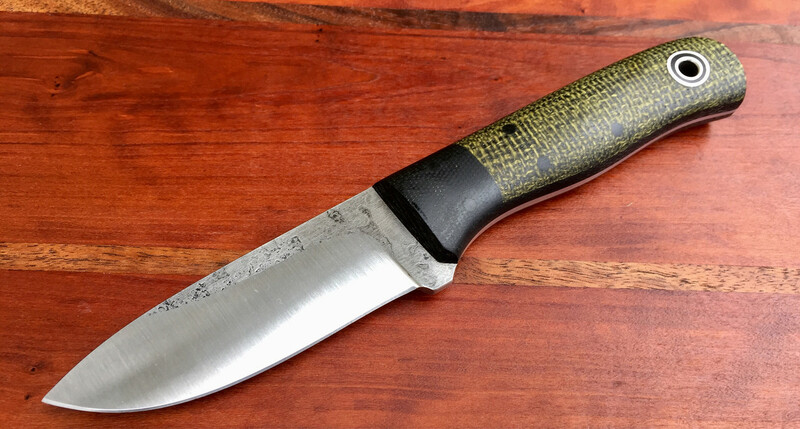 Fiddleback Forge Bushcraft Jr black bolstered g10 with shadetree evergreen burlap scales. Convex spalted 5/32 taper Tang steel. 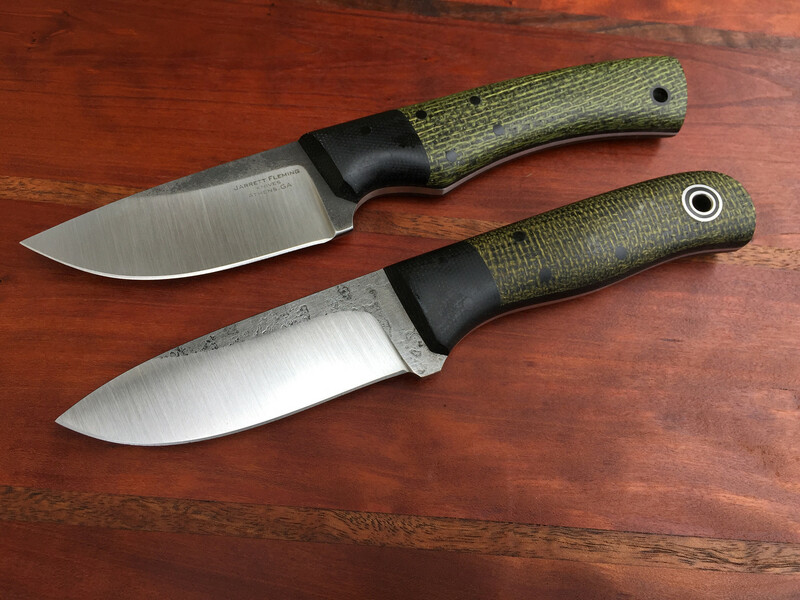 Black bolstered g10 with shadetree evergreen burlap scales. I’ll take the Jarrett Fleming Hunter. Going to the post office this afternoon.... would love to send the patch in post #13219 to its new home. How about $PF shipped. other memory, Freedom Pullo and Wondering Wildcat like this. WTB: Sheath for custom Duke. Bmurray, RobbieB, Dritios and 4 others like this. Nbrackett, Lady1911, Scotcha and 1 other person like this.